Best place at the beach! Please note: During High Season, April 1 - August 9, bookings must fall between Saturday and Saturday. Enjoy a spectacular holiday in this gorgeous condo. With almost 1500 sq ft of living space, you won't feel crowded. The master bedroom has a King Size bed, a flat panel TV, a chaise lounge and a spacious ensuite bath with a glass enclosed shower, jetted tub, dual sinks, make-up counter and separate toilet. The second bedroom has 2 queen beds, also ensuite full bathroom with tub/shower/toilet and flat screen TV. Additionally, there are 2 fold-out twin beds which can be set up in either bedroom or the living room. The living room couch converts to a sleeper sofa and there is a third guest toilet near the entry. A large wrap-around balcony has plenty of space to enjoy breakfast with an unobstructed gulf view and each bedroom has its own private balcony. The kitchen has all cookware, plates, glasses, wine glasses, toaster, electric kettle, and a KEURIG coffee machine with coffee waiting for you! NO SMOKING and NO PETS are allowed. The 'no pets policy' is strictly enforced by property management. It's a fantastic place to relax and recharge. Of course we have WIRELESS INTERNET so you can stay connected to the world, even though you may feel you have stepped away from it all! Our condo building offers underground parking, elevator baggage trolleys and is designed with luxury in mind. If you've ever been heading east on the outskirts of Destin along Scenic Gulf 98 you've probably noticed the one resort which stands out from the rest...MEDITERRANEA. Classic elegance and incredible landscaping define this well kept gated community with amazing curb appeal. Mediterranea is one of the most sought after properties. Treat yourself to a beautiful view and relaxing vacation. Enjoy access to Mediterranea's PRIVATE DEEDED BEACH area as you stay in one of the nicest resorts in Florida. Come and be refreshed, blessed, and rejuvenated. Our property has its own private beach. Enjoy magnificent gulf view from the balcony as you sip your morning coffee! dedicated parking spot underground and ample additional spots in the parking lot. Will definitely stay here again. Beautifully decorated, well maintained complex, great location...can't say enough great things about our stay. So happy you enjoyed your stay! We strive to keep our property the way we would want to find it if we were renting it! Thanks for submitting a review! We love everything about Mediterranea 303. The location is perfect and the condo amenities are top notch. Booking is easy and Karin, the owner, is a pleasure to work with and couldn't be more responsive to my inquiries. We've already secured our reservations for 2018! This property was amazing. It was on Scenic 98 where we always stay and right across from the beach. The view was spectacular. The condo and amenities were amazing. We can't wait to come back and stay again! Loved it! We just returned from our Destin vacation and this condo was perfect! 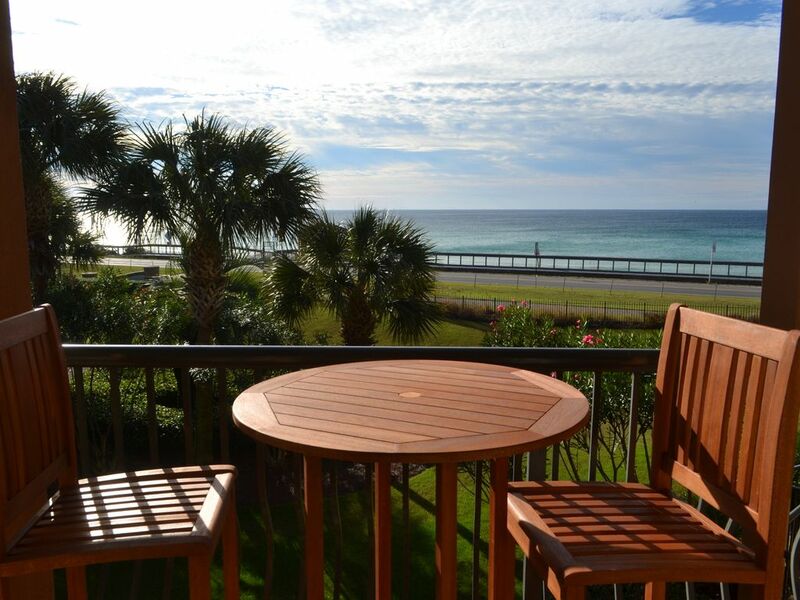 We have vacationed in Destin for many years, and the location of the Mediterranea complex is ideal and the condo's views are exactly as shown in pictures. The condo is conveniently located to its reserved parking spot as well as easy access to pool/beach. We stay in for most of our meals, and the kitchen is nicely appointed should you choose to stay in and cook with all appliances in good, working order. Karin was a pleasure to work with during the rental process. She responded quickly to initial inquiries and the entire process from initial inquiry to booking to check out was simple and efficient. We're already planning our next visit. We spent the month of February at this amazing condo with gorgeous views of the gulf and everything one could want or need. We walked miles daily on the boardwalk, sidewalks and beach. Numerous bars are within walking distance to enjoy happy hour and beautiful sunsets and you can't forget the shopping and vast variety of restaurants close by. We would rent this condo for February 2017 but it is already rented. Just 2 miles west of the Silver Sands Outlet Mall, on scenic gulf drive, just past Frangista Beach. Renter will be held responsible for any damage/breakage resulting from unruly children, and other willful destruction. There will be a $300 cleaning fee charged for anyone smoking in the unit. THIS UNIT IS FOR NON-SMOKERS ONLY!